I bought the dress form you see in the above photo while still in California, and for a while, it worked pretty well. I had it pretty close to my measurements. But sadly, neglect set in and I've gained weight. 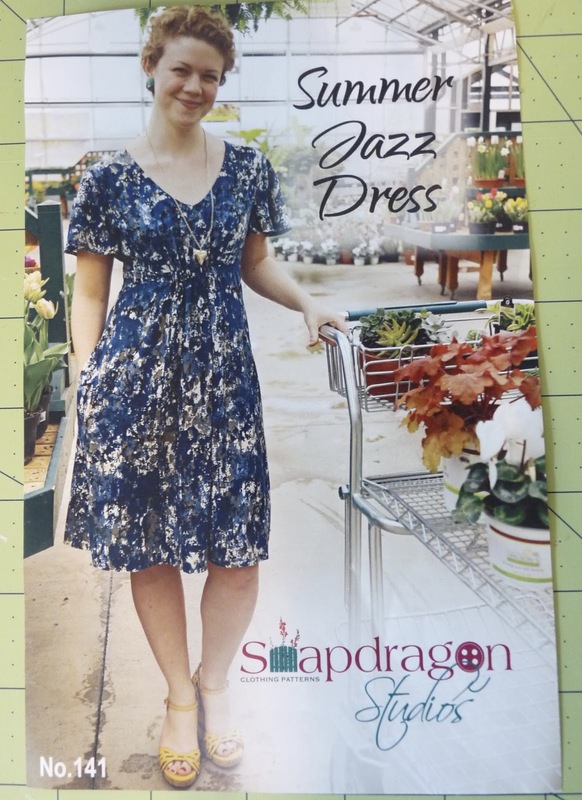 In this post, you can see how loosely the dress hangs on the form. It fits on me a whole lot better, but it's not perfect. Since I paid good money to have it stored for nine months and then shipped to the new house, I thought I had better make use of it. As I mentioned in the last post, I purchased a Craftsy class, Customize Your Dress Form with Judy Jackson, on how to make a dress form cover to match your own body. I took inspiration from Bunny at La Sewista, who made her own cover a few years ago. Click on this link for her last post on it. I also studied the tutorial on by Laurie Nash of Sew Chic, which is very in depth. This link will lead you to her first post of the tutorial. 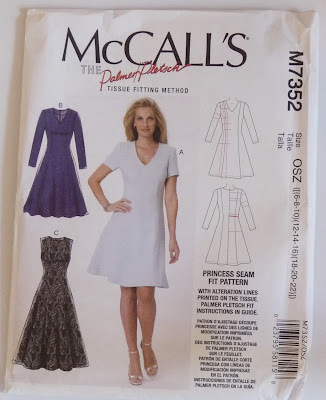 One of the things that is all important is to make sure to pick a good pattern, specifically one with princess seams that run up to the shoulder, not the armscye. I used McCall's 7352 for this. For the fabric it is important to use something not too light. I thought I had the perfect fabric, some pink drapery fabric from about 30 years ago. It was nice and stiff, but it had a distortion that no amount of ironing would remove. After washing it, the distortion came out, but now it was just a lightweight cotton fabric. So I went ahead and made the cover anyway. After about five or six fittings with only Mr CS to help, it was pretty well molded to my body. Then I realized that it looks like a micro mini skirt, way too short, and the neckline isn't quite high enough. Rummaging through my stash I found a darling pink toile upholstery weight fabric that would be perfect. So I took the first attempt apart and used it to cut the toile fabric. I transferred all seam lines to the new fabric with a tracing wheel, but realized that I need to see the marks from both sides. So I thread traced all seam lines. What a great idea. I could match all the seam lines pretty accurately now. The Craftsy class instructed us to pad the form with polyester batting, which I thought made it too soft. Besides, I had only a bit of batting and a lot of look fiber fill, which was impossible to place on the form and hold in place. Laurie at Sew Chic said to use cotton batting, which I have a lot of, so that's what I did. I used lots of paper tape to keep everything together. 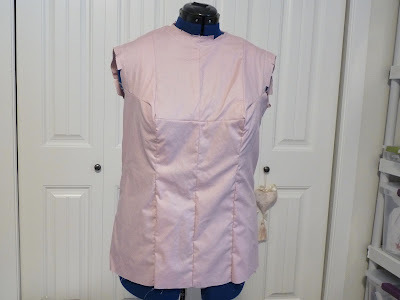 I also copied Bunny's method of adding a neckband and covering the armholes. Luckily I had a set of curved needles used for tying quilts, which really helped to get the neck and armholes in. I used a 30 inch separating zipper in the back, and ran a cord around the bottom casing to gather the extra fabric in. Not quite tight enough, but it matches! Laurie also says to spray the form with water and let dry to help smooth out the bumps. This photo is before I did that. It's now dry but doesn't look all that much smoother. But, I have a form with correct measurements and that's what matters. Since I'm not likely to make anything very form fitting, a few wrinkles in the hip area won't matter too much. 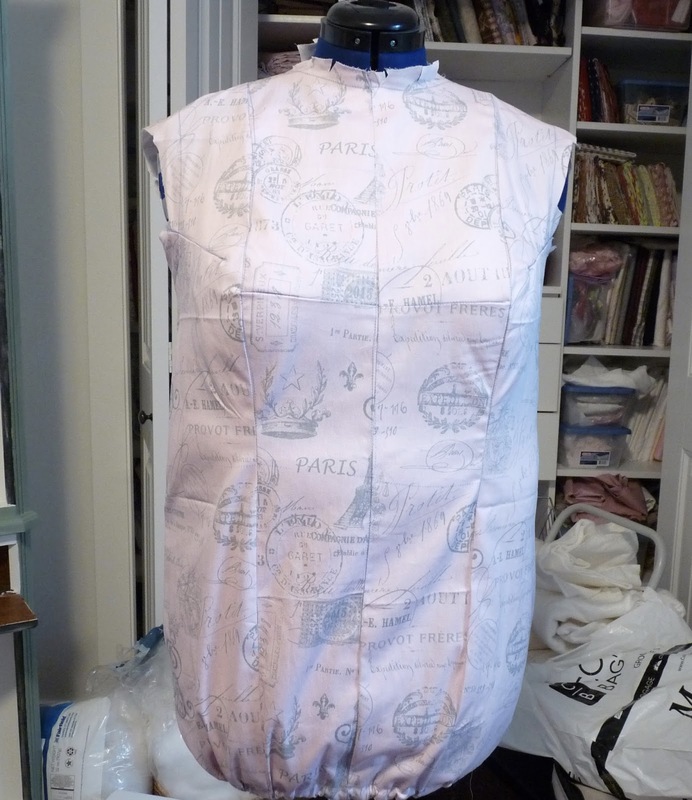 I still need to mark the waist with a ribbon (it's now only chalk) and the shoulders, since mine are a bit narrower. This whole process makes you look at your figure very critically and gives you more insight into how your body looks. I discovered I have a bit of a swayback, which I never realized before. Since I've started this, I've really made sure I'm eating right and have been exercising, so I expect to lose a bit of weight. But that's OK, if I lose enough weight I can take it apart, refit, and take away some of the padding. Which would be a very good thing. 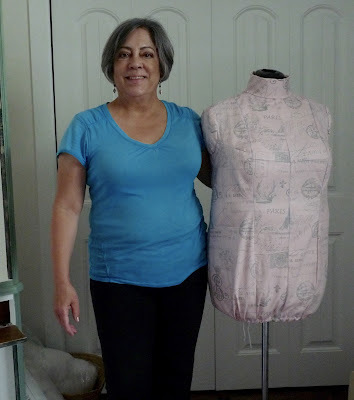 I want to thank Bunny at La Sewista and Laurie at Sew Chic for kindly posting on how they made their forms. 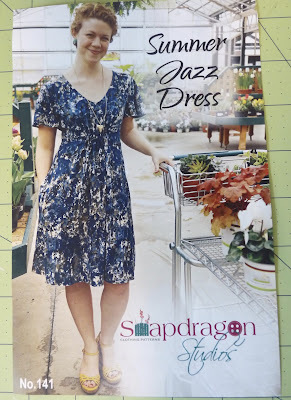 I read all the posts several times along with the Craftsy class and now feel I almost have a handle on this. The sewing room is slowly coming together, as you can see. All the boxes are removed and only a few remain to be unpacked. I decided that function trumps form in organization, so instead of buying cute antique furniture to store my projects, I bought large plastic tubs and organized all of the projects in them. I labeled each one with a category and number, such as "Quilt", or "SEW", and inventoried each project that went into them. It was a scary proposition. I have so many projects I don't see how on earth I'll get them done in my lifetime. So I've started a donation bag, and have put some things into it. I have also come across some fabric that I'll never use, and brought that to my tatting group. Most of them sew, and were glad to get some free fabric. My daughter is learning to crochet, so she got all the yarn and hooks, and the knitting supplies went to the Loveland Library Knitting Group. I do have one antique piece, well, vintage really. This was in our family room in California, sitting in a nook once occupied by a wet bar long since torn out. I haven't quite decided just what to put in it, so it's mostly empty now as I figure out what to use it for. I still have to figure out pattern and thread storage, and what to put on the walls. There is a lot of space just waiting to be used. Last year I bought this Craftsy kit, and it went into storage. As I was going through all of my projects I decided to put it together right now as it is so hot. The fabric is a rayon challis which was a bear to sew as it is so slippery, like silk charmeuse. 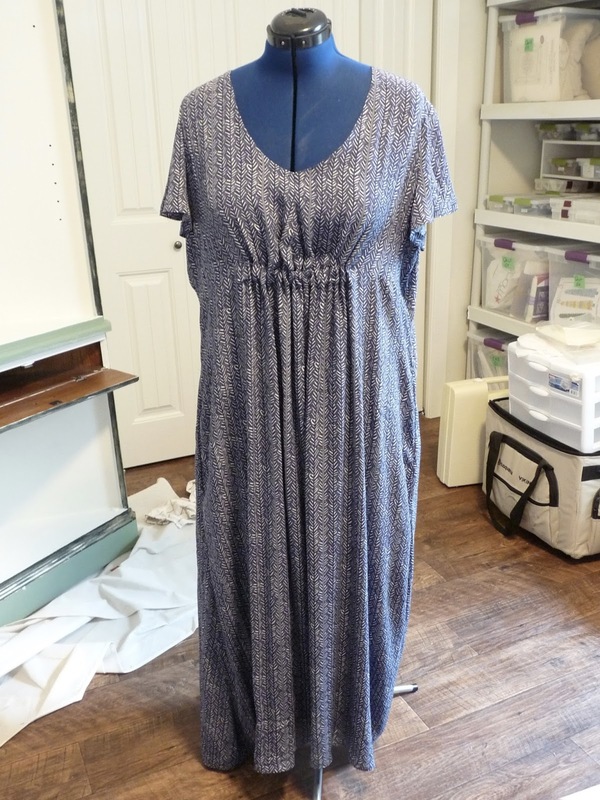 The sleeves are fairly wide, and I hemmed them with self bias strips that I cut myself. Next time I'll make cotton strips which should be easier to handle. I also will use maybe a cotton voile or lawn instead of rayon. 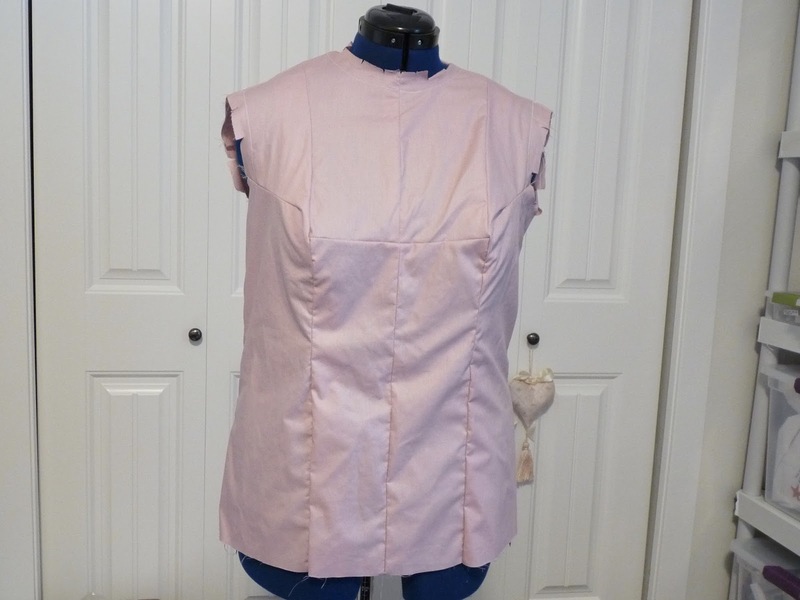 But it looks fairly decent and is very comfortable to wear, except that as it is loose fitting, the shoulders tend to slip. It looks huge on the form, but that is because I bought the form about 20 pounds ago. I don't have a photo of me in it, as we went walking this morning and I don't want to put the dress on my very nasty body right now. I went leafing through some of my sewing books and came across lingerie stays made with ribbon. I've seen them with crocheted thread, but this was pretty easy. I couldn't find snaps so I cut some from some baby snap tape that I had. I have since found the snaps that are not attached to fabric. I realized that since it was so long since I've posted, you might want to see what my little grandson looks like now. I just love those curls (and that big sink). Can you believe he is 20 years old? We got Oscar in mid August, 1996, and he was six weeks old at the time. So I figure his birthday is right about now, the first week in July. In human years he is 97! He has settled beautifully in the new home and goes out to sit by his catnip on the right. My next project, before I sew anything else, is to get that dress form into shape. It's not doing me a bit of good being a size too small. I've just started a Craftsy class on this subject and can't wait to get going. 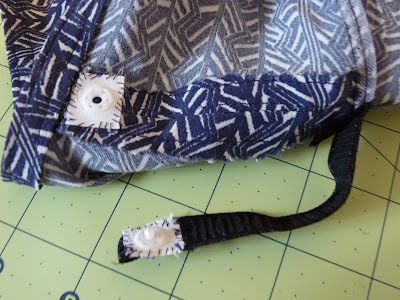 I have some old drapery fabric purchased about 30 years ago, so all I needed was a long zipper and the pattern. Stay tuned, I'll post my progress on it.